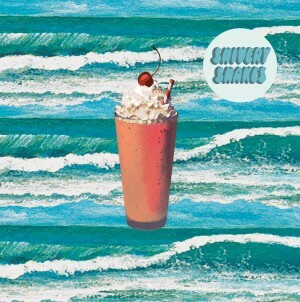 The new album from Austin band Shivery Shakes, titled Three Waves & A Shake, is the perfect blend of Buddy Holly and Beach Boys-inspired pop that’s great for anyone seeking a light and wispy change from many of the harder and edgier bands heard around town. The band has released several EP’s over the past few years, including the 7-inch single Sidewalk Talk/So Long, released last December. Three Waves opens with a catchy number called “Recurring Dreams,” an easygoing and dreamy track that brings us back to the simpler days of the 1950’s and the beginnings of rock and roll. While the song has a lighter feel, it really fits the bands style beautifully. They’re so comfortable with their own style that their songs just sound more listenable than many of the bands in Austin. “Remember When” is the record’s next tune, and it has the same dreamy vibe of its predecessor. While it doesn’t have the polished vocal style of The Beach Boys, Shivery Shakes nails that musical style. Anyone longing for a day in the sun will enjoy this breezy tune. “One More Try” is slightly more complex sounding and takes a harder angle, though to call Shivery Shakes a true rock band would be pushing it. Every song on Three Waves & A Shake comes off mellow, which makes the album hard for anyone to dislike. “Strange Houses” is an unpolished gem with a cool garage-band vibe. Though it feels like they haven’t quite cemented their sound for mass appeal, they are so convincingly good that the garage-like sound won’t matter to most listeners. Lastly, Three Waves & A Shake ends with “Time Will Tell,” a hazy-sounding tune with plenty of shimmer from the guitars. While no song is intricate on the Shivery Shakes latest effort, its appeal will be noticeable right away. For those new Austinites who are being introduced to the eclectic Austin music scene for the first time, Shivery Shakes are a good band to start out with as their playing abilities and charm are apparent right from the start. Here’s a selection from Three Waves & A Shake. You can buy their album from Austin Town Hall Records for $15.